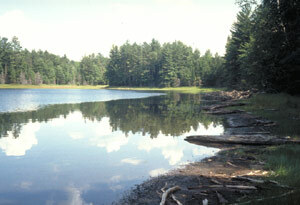 The United States Congress designated the Rainbow Lake Wilderness (map) in 1975 and it now has a total of 7,135 acres. All of this wilderness is located in Wisconsin and is managed by the Forest Service. Slightly more than six miles of the North Country National Scenic Trail cross this Wilderness from northwest to southeast, passing close to Rainbow Lake itself. Anderson Grade is the only other maintained pathway, crossing from east to west for about four miles. Rolling terrain stands cloaked in northern hardwoods, balsam fir, pine, and paper birch that provide shelter for deer, black bears, red foxes, and coyotes. Hiking is relatively easy. Bald eagles, hawks, owls, loons, woodpeckers, and songbirds enliven the skies, and waterfowl are often seen on Reynard and Wishbone Lakes. Thousands of migrating birds stop for a rest in spring and fall. Anglers should find the panfishing excellent on Rainbow Lake, and very good in the 15 other lakes and nine small ponds. The lakes also attract canoeists. Cross-country skiers come for the winter snow. The area is tightly bordered by Forest Service roads, providing easy access. Planning to Visit the Rainbow Lake Wilderness? How to follow the seven standard Leave No Trace principles differs in different parts of the country (desert vs. Rocky Mountains). Click on any of the principles listed below to learn more about how they apply in the Rainbow Lake Wilderness.